This book concerns the drama and mystery surrounding a code left by Houdini and supposedly known only by him and his wife Bess. He promised that after his death, if possible, he would communicate from beyond the grave. His wife would then affirm the communication if the prearranged words were correct in respect to the code. The code was used by the Houdini's in the early days of their act. Although the story of the code along with Houdini and Bess has been portrayed in films, written of in books and debated by magicians and researchers for years since Houdini's death in 1926, Rauscher is the only one to reveal the answer and solve the riddle. The author adds to this puzzling array of many characters his first hand knowledge of the famous medium, Arthur Ford who was credited with receiving the message from Houdini and affirmed in a sworn document by Mrs. Houdini. Rauscher's friendship with Ford, his work on Fords biography, The Man Who Talked With The Dead, places him in a unique position to finally reveal the truth behind one of the 20th century's greatest mysteries...Do the Spirits Return? In addition to the Houdini Code, Rauscher presents an in depth overview of the personality of Houdini and how he became an American icon. He has painted a unique, perceptive word portrait of Houdini quoting numerous great magicians of his era who speak candidly of the master escape artist. The book is a kaleidoscope of unusual and colorful characters. "This book contains the most complete, accurate and courageous description of the way magicians and laypeople during his lifetime regarded Houdini & status stripped of the layer of present day myths added by persons who never saw him work or were even born when he lived." "This is not a book about Houdini. Rather it is about the creation of the Houdini myth, and in particular, the one event that Rauscher argues brought Houdini's name back to the forefront of public consciousness with such force that it magnified his reputation far beyond the bounds of historical achievement. 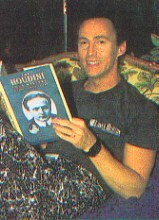 This event was the claim by spiritualist medium Arthur Ford that the deceased Houdini had given him a message for Houdini's widow, a message that she publicly accepted as genuine...noted bookman, collector and scholar George Daily told me he feels that this is Rauscher's finest book to date." "You may be thinking, 'Who needs another book on Houdini?' Well, I found this book fascinating and read through it in but two sittings. It may well be the most straight-talking, honest book about Houdini the man written to date."